(Family Features) From dark and moody to vibrant and bold, colorful design is gaining favor among homeowners ditching safe, neutral palettes to create more daring, dramatic spaces. Decorating with deeply saturated colors can be intimidating. Explore these ideas to welcome more bold colors into your home and create inviting spaces for living and entertaining. Say goodbye to beige and embrace the bold color trend by enhancing walls with hues that make a statement. The trick is to avoid making colors so loud that the space loses its stylish appeal. Bold doesn’t necessarily mean bright, so look for muted variations of the shades you prefer. Also remember that when it comes to design, there is such a thing as too much. If painting all the walls in a space will close it in or make it feel lost in the dark, try adding color in more subtle ways, such as an accent wall (or two), or painting the ceiling as your accent. Another option for implementing vibrant wall color: stick to smaller rooms, where the bold look is less likely to be overwhelming. When decorating with statement colors, remember that lighting can make a significant difference in the overall aesthetic. In addition to lighting fixtures, be sure to incorporate plenty of natural light to bring out the best in those bold hues. To bring natural light deeper into the space, consider skylights as an option with a solution such as Velux No Leak Solar Powered Fresh Air Skylights, which can bathe the space in natural light and open to bring in fresh air. Another smart way to capture natural light is by installing an option like Sun Tunnel skylights. With their low-profile design, they create a sleek appearance, and installation is also quick and easy. Learn more at whyskylights.com. An often overlooked but essential component of design is the furniture. Creating a colorful, inviting room doesn’t stop with the walls and floors; what’s in the room can bring the colors to life. Think of the space and all its contents, not just the architectural components, as your canvas for creating the space you envision. If you’re hesitant to invest in a pricy couch in a trendy hue, a compromise might come in the form of a richly colored accent table or chair. Traditional wood grain cabinetry sometimes gives way to far more creative color schemes in kitchens and bathrooms. While white is still a popular choice, and can even be considered bold in the right setting, true color on cabinets is also gaining traction among homeowners. With the right backsplash, countertops and flooring, you can safely install cabinets in a uniform color throughout the kitchen, but another on-trend option is to reserve the color for an island base or just one wall of cabinets. You could even mix and match colors on the tops and bottoms. Detail elements like the hardware provide another opportunity for a bold look. You can enhance the room’s design with standout pulls that lend extra vibrance to the space. Textiles provide nearly unlimited options to balance a bold design. Using lighter fabrics for elements such as draperies, upholstery, rugs and decorative pillows can soften the feel of a room with bold tones. Look for subtle patterns that pull in hints of the deeper hue to bring the look together, or simply coordinate shades from complementary color families. Designers often talk about adding pops of color to bring together a palette, but there are no real rules about where those color enhancements can or should be. Introducing vibrant color in unexpected places can be an especially impactful way to stylize a room. One example is with a skylight blind, which provides a decorative element while also allowing for light control. 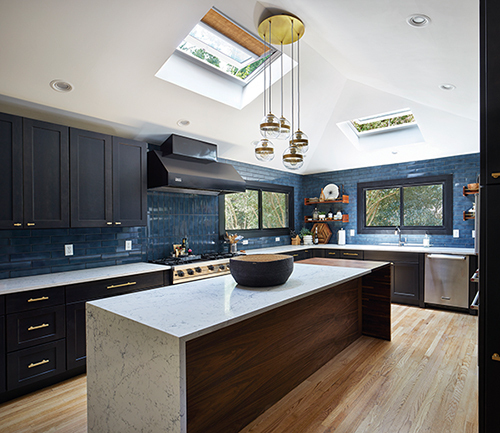 If you prefer a trendy option like combining dark colors with metallic accents, consider options such as a metallic gold skylight blind from Velux to connect to the room decor below. More than 80 color and pattern choices heighten the drama of a skylight blind, and you can choose from features like room darkening, light filtering and Venetian-style blinds to add function as well.